Ear tube insertion is the placement of tubes near a child’s eardrums. It is done to allow the fluid behind a child’s eardrums to drain so that the ears can function normally. While the child is under general anesthesia (asleep and not able to feel pain), a small surgical cut is made in the eardrum. The built-up fluid is suctioned out through this cut. Then, a small tube is inserted through the eardrum. The tube allows air to flow in and fluid to constantly flow out of the middle ear. Ear tube insertion may be recommended when fluid builds up behind your child's eardrum and does not go away after 4 months or longer. Fluid buildup may cause some hearing loss while it is present. But most children do not have long-term damage to their hearing or their ability to speak even when the fluid remains for many months. An ear infection is another reason for inserting an ear tube. If an infection does not go away with the usual medical treatment, or if a child has many ear infections over a short period of time, the doctor may recommend ear tubes. Your child’s ear specialist may ask for a complete medical history and physical exam of your child before the procedure is done. Your child will usually be asked not to drink or eat anything after midnight the night before the surgery. The doctor will make sure your child is healthy enough for surgery. This means your child has no signs of illness or infection. If your child is ill, the surgery may be delayed. Children usually stay in the recovery room for a short time and leave the hospital the same day the ear tubes are inserted. Your child may be groggy and irritable for an hour or so as they awaken from anesthesia. 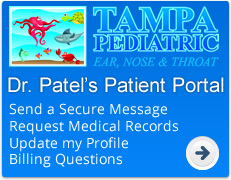 Your child’s doctor may prescribe ear drops or antibiotics for a few days after the surgery. Most children can return to normal activities the day after the surgery. Some ear specialists will recommend earplugs or swimmer’s headbands while swimming or bathing to keep water out of the ears. If earplugs are not recommended for these activities, they may be recommended for diving in deep water. Check with your ear specialist. The surgical cut heals on its own, without stitches. The hole closes, and the ear tubes usually fall out on their own after 14 months or so. After this procedure, most parents report their children have fewer ear infections, recover fast from infections, and that they worry less about whether their child has ear infections. If the tubes do not fall out on their own, an ear specialist may have to remove them. If ear infections return after the tubes fall out, another set of ear tubes can be inserted.